If you are using Django for production level application, you will need to use south. Requirement changes, and therefore your data model will change over time. South is a great tool, but it is complicated. You do not want to make a mistake when migrating an application in production. This is a detail look at how it interacts with your application so that you can understand and use it better. models.py — South reads this to determine your current data model. migrations/*.py — South creates a sub directory inside your app, and creates for you a migration file for each database migration generation. You can also create these by hand, but normally you will let south creates them for you. south_migrationhistory table in your database — when you install south, it creates it’s own table and use it to maintain states. Specifically it records the state of the database in this table. South assumes the application schema in the database is consistent with what it records in this table. your application’s schema in your database — south create and update the schema for you according to the database migration generation, which is the ultimate purpose of using south. 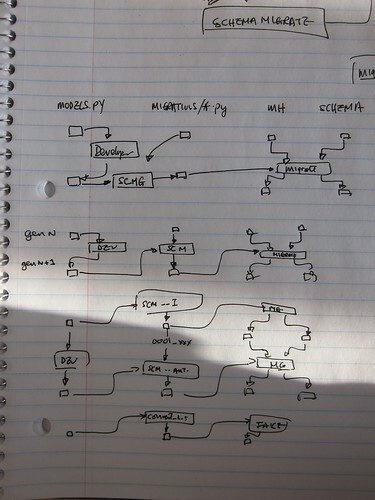 updating the application's data model. a migration file for generation N+1. 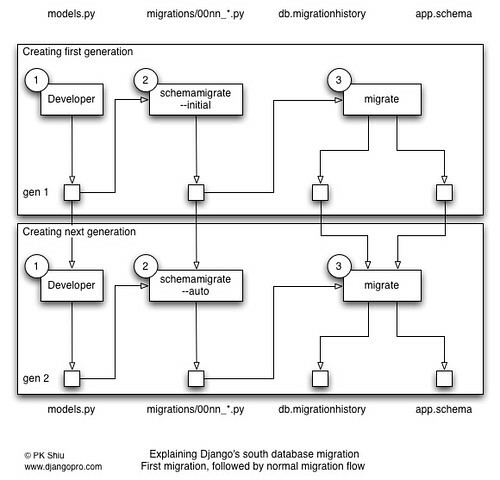 schema and migrationhistory table to generation N+1. defining the  application's data model. 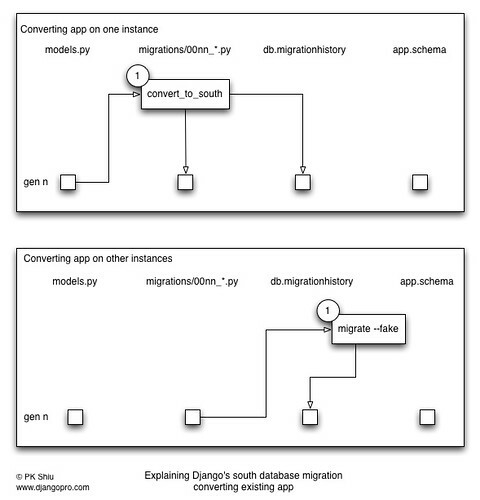 create a migration  file for generation 1.
schema and  migrationhistory table to generation 1. Converting an application is a little different because the database schema and the models are already in sync. Somehow we need to “trick” south into creating the other two items, the migration file and the migrationhistory table entry. We also need to deal with the conversion on the first instance vs other instances differently. For the first instance you will create the migration file, and for all other instances you will use the migration file to simply create the migration history table entry. file for generation 1, and also to create the migrationhistory entry. the migrationhistory without changing the database schema. There are several different things you can do to “dry run” your migrations. The -stdout argument will have South generate and print out the migration code on the console instead of writing it out to the migrations directory. You can do this before you do the actual database migration schema generation. Note that schemamigration only creates the next migration script in the migrations directory. Worst case is you can just delete that file if you decided the migration schema is not needed. This will run the migration except the database is not changed, and the migration is not recorded in the history table in the database. Sometime I need to reset a migrated environment. This is particularly useful during initial development of an app. This special command, migrating to the “zero” state, will remove all migration history in the database, but leaving any migration files intact. Thanks Oli ! Didn’t even notice WP was doing that. Anyone copy and pasting the commands will be pulling their hair out. Thanks for the tip. OT: What tool are you using to generate the diagrams? I use omnigraffle to draw those diagrams. I have a love/hate relationship with Omnigraffle. While it is *the* diagramming tool for Macs and it is very nice, it still has quite a learning curve. I am slowly getting there. For pasting code with WP I’d like to recommend to install the wp-syntax plugin and to disable the so-called visual editor in your user prefs. Thank you for the great article! I use “syntax highlighter evolved” normally. Since those are just commands I didn’t want them to look like “code”. But maybe I’ll give it a try. Thanks! Most of the database migration tools I’m aware of are integrated into existing Web frameworks, such as django, web2py. What are the other available and efficient libraries when you are not using such Web framework, but, for instance, Tornado. I rapidly took a look at SQLAlchemy migrate tool. Any good or bad experience with it? I haven’t used SQLAlchemy, but if you’re looking for a standalone schema migration product, have a look at Liquibase. It’s written in Java (fair warning for those Javaphobes), and integrates well with deployment tools like Ant and Maven. I like mariposa / django-mariposa (I wrote the django bit and contributed to mariposa). Very simple. Sorry but the only migration tool that I actively use is south with Django. whats about production and development database? Do I have manage both by hand? Do south understand which migrations are missing on both sides? @becker — south does not need to know production vs development. If you are using south in your project, everyone/every instance need to be using it too. For example, we run personal (development) instances with all different variations, a mixture of sqlite3, OS X, postgresql and ubuntu, but we then we deploy into several layers of acceptance testing environments. South keeps track of what steps each database (per app actually) is at and will migrate from the correct point onwards. django-admin.py migrate –list will tell you where the current database is at and how many more migration steps are needed, if any. Hey, great post. Should it really be this easy to use south / migration? I usually peek at it when I start another django app, but then discrad the idea of using it for beeing “too difficult to work into”. i am definetely trying this next time around. Nice article, well explained and easy to understand, Thanks !! Seriously great post, I always did my migrations manually but now will revisit using South on next project. Have you had any experience with django-evolution? Daniel – I have followed you on Twitter. I have not tried django-evolution. How would you sync a newly created Django app with a legacy database? And a little different, how do you handle database schema changes that originate in the database? Great article! South is one of the most useful 3rd party app available for Django. However, it’s tutorials and documentation are not the best IMO. The official tutorials do not cover the simple use cases very well. I have always been ended up being confused when going through their docs and then trying things out. South can take help from a simpler getting started guide and this article does just that. I have messed up my migration files and schema in one of the app in my project. I guess it is due to VCS .I had faced this problem before to but i have deleted my db or flushed my db file and recreated every time i messed up with south migration.But this time i dnt wanna flush my db n I m unable to fix it. 1) What is the best way to get through it or is there any way i can just flush tables of only this app. 2)Should I backup my DB file in VCS?? 3)Should i delete my migration files every time i clone my project in new computer? mkvirtualenv problem on Mac OS X Lion? Should I Upgrade to Django 1.3? Copyright © 2019 PK Shiu. All rights reserved.